What would life be like if humans had the ability to colonize Mars? 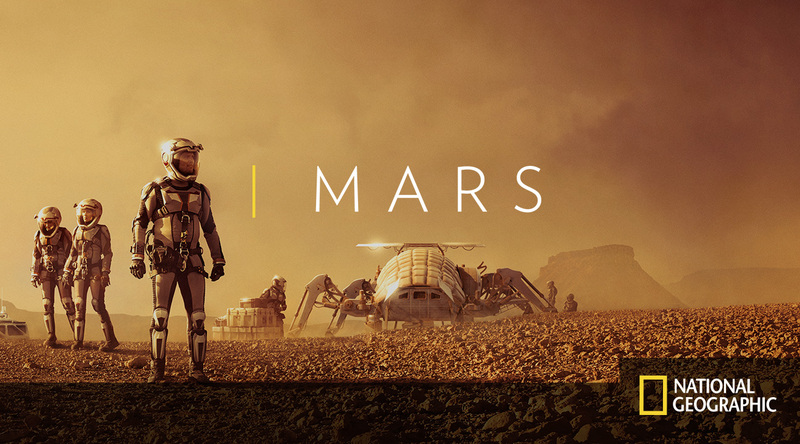 In National Geographic's Mars, the question is being answered. The 6-part combination of mini-series and documentary is available now on Blu-Ray and DVD for home viewing and we've been watching it as a family. Both kids, ages 11 and 14, are enjoying it and Mars is making for some great family movie time. 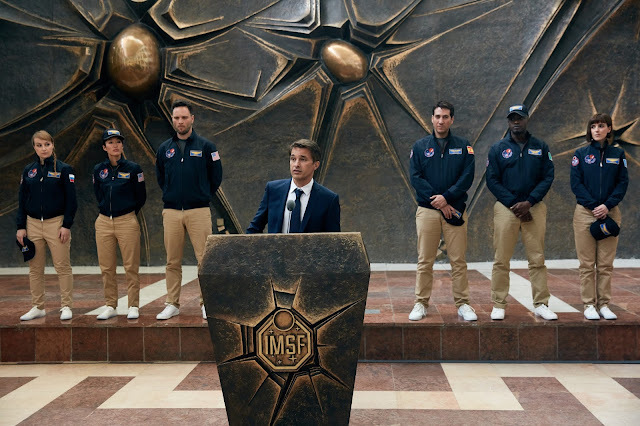 The mini-series part takes the viewer to 2033 and the world's first attempt at colonizing Mars. Six international astronauts have been hand-selected for the first attempt at colonizing Mars. They leave Earth for a 200+ day journey to even reach the Red Planet. Once they arrive, their goal is to begin setting up a colony that can sustain human life. Interspersed in the storyline are "flashbacks" to 2016. During these, documentary clips feature scientists and visionaries who are working to further the options in space travel, including Elon Musk, Neil deGrasse Tyson and Stephen Petranek. Where are we at today and what are our next goals outside the earth? There's a universe ahead of us! There's also a great companion book to this series, called Mars: Our Future on the Red Planet by Leonard David. It breaks down more information about what we know about Mars and what we need to know before the Mars show can become a reality. Could you imagine a trip to Mars? What about starting a brand new colony there, especially if you knew it would be more than a year until anyone could resupply you with what you needed? That's what the kids and I were discussing after the movie. We had trouble figuring out what we would need, once we got past the essentials. All three of us had different ideas of what comfort and necessities might entail. 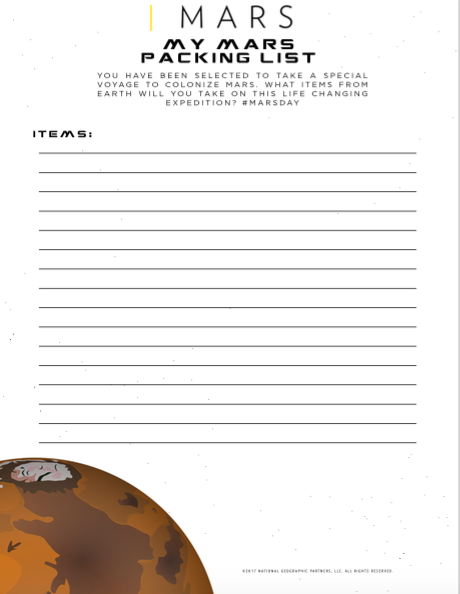 We'll be working some more on our Mars packing list as part of a homeschool assignment. 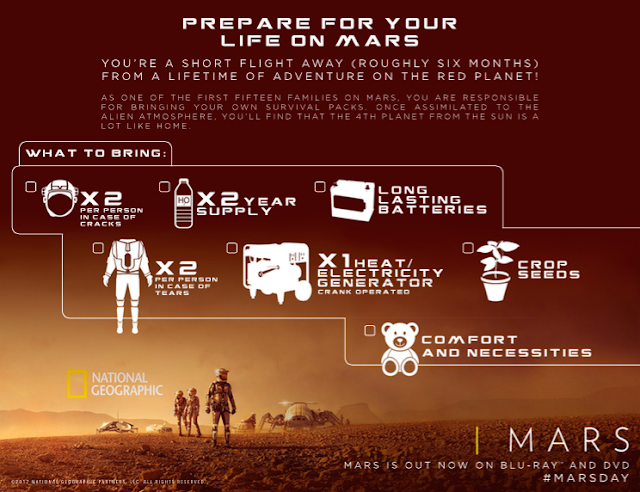 Mars Infographic "Prepare for Your Life on Mars"
Mars "My Mars Packing List"
Both printables are great starting points for homeschool assignments. You could consider a creative writing assignment on moving to Mars, an expository paragraph or essay explaining why your student has chosen certain items besides the necessities, or even journey off on a science project to learn more about Mars being able to sustain life. The possibilities are endless! While we aren't quite heading to Mars in the next couple of months, we'll be finishing up the series and enjoying some more Mars related activities. Disclosure: The information in this post, a copy of National Geographic Mars, and a copy of Mars: Our Future on the Red Planet, were provided to me as part of my relationship with Fox Home Entertainment Insiders. All opinions expressed are my own.